Well, I saw my first golden eagle up close this morning! As I was driving through the mountains, almost to town, I saw a movement to my right out of the corner of my eye. Yup. 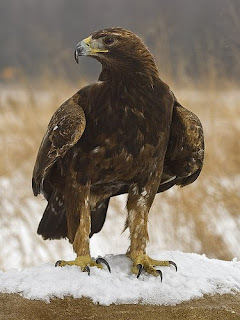 A golden eagle, aquila chrysaetos. He/She was very large and dark brown. Definitely NOT a hawk! I've seen the hawks up there and this was no hawk! It began to unfold its wings and start to take off. A nearby field had recently been plowed, so it was probably after some rodents. What a beautiful bird! Unfortunately, I had 3 cars behind me, so I didn't stop and attempt to take its photo. This isn't my photo. Aren't they beautiful birds? I was talking to Bill, who owns the ranch where I board my horses, and he said, yes, their valley does have golden eagles. He can see them from their porch. They move around, depending on where their food is, but they still stay in the valley. Don't you love spotting the rare ones? Aren't they too cool?! We always have a few along with Balds come in for the winter near the house. By srping they've gotten a little more used to me stopping to watch and don't fly off as often. I'm happy for you that you saw a golden eagle! A few years ago, for several weeks in the winter, we had a bald eagle hanging around.....very strange.....never happened before or since.